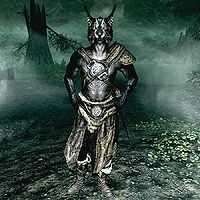 Ra'jirr is a Khajiit bandit living in Frostmere Crypt. He currently works under Kyr, and is the partner of Eisa Blackthorn. He used to be a fearsome bandit, but after Kyr claimed a sword unearthed in the excavation of Frostmere Crypt he began to hallucinate about the Pale Lady. He is hostile to you and can be found fighting the Pale Lady in the underground forest. He will most likely die during the related quest, either by your hand or from the Pale Lady's attacks. It is possible to complete the quest without killing him by defeating the Pale Lady and pickpocketing the Pale Blade from him. Should he survive, he will remain standing in front of the pedestal indefinitely. This page was last modified on 30 August 2014, at 18:32.